A substance in which a large number of non-metal atoms are covalently bonded in a continuous network. A substance in which a large number of non-metal atoms are covalently bonded in a continuous network. Giant covalent structures – such as this yellow diamond – have high melting points, as lots of energy is needed to break the strong covalent bonds holding them together. Sand is mostly made of silica – a compound of silicon and oxygen – arranged in a giant covalent structure. Silica is a raw material in the creation of silicon chips. Its giant covalent structure has low electrical conductivity, which makes silicon chips ideal for use in almost all electronic devices, from mobile phones to industrial robots. 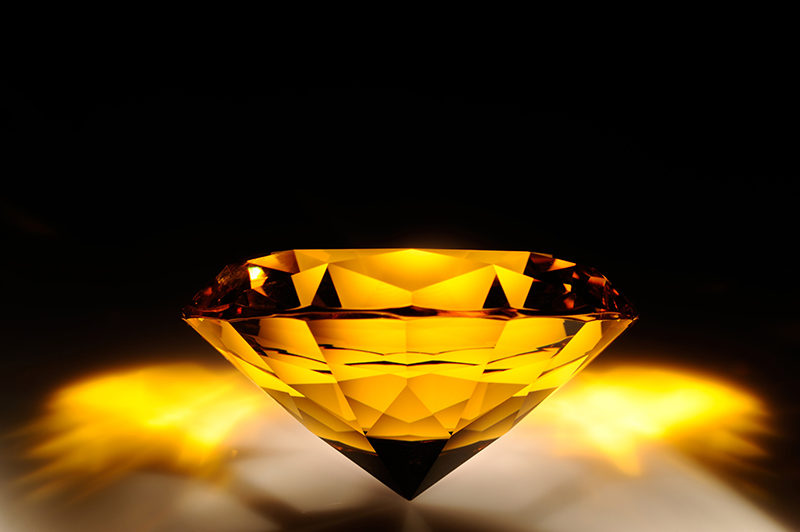 Giant covalent structures – such as this yellow diamond – have high melting points, as lots of energy is needed to break the strong covalent bonds holding them together. Sand is mostly made of silica – a compound of silicon and oxygen – arranged in a giant covalent structure. Silica is a raw material in the creation of silicon chips. Its giant covalent structure has low electrical conductivity, which makes silicon chips ideal for use in almost all electronic devices, from mobile phones to industrial robots.